The F2 is designed for the beginning exerciser new to heart rate workouts. One button operation and bold numbers make it easy to use during any exercise. Tracks heart rate and exercise time continuously. 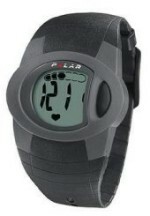 Provides your average heart rate at the end of your workout so you can track fitness improvements. Comes with Telemetric chest strap.